Most nations abandoned the gold standard as the basis of their monetary systems at some point in the 20th century, although many hold substantial gold reserves. A 2012 survey of leading economists showed that they unanimously reject that a return to the gold standard would benefit the average American. The gold specie standard arose from the widespread acceptance of gold as currency. Various commodities have been used as money; typically, the one that loses the least value over time becomes the accepted form. Chemically, gold is of all major metals the one most resistant to corrosion. The use of gold as money began thousands of years ago in Asia Minor. During the early and high Middle Ages, the Byzantine gold solidus, commonly known as the bezant, was used widely throughout Europe and the Mediterranean. However, as the Byzantine Empire's economic influence declined, so too did the use of the bezant. In its place, European territories chose silver as their currency over gold, leading to the development of silver standards. Silver pennies based on the Roman denarius became the staple coin of Mercia in Great Britain around the time of King Offa, circa 757–796 CE. Similar coins, including Italian denari, French deniers, and Spanish dineros, circulated in Europe. Spanish explorers discovered silver deposits in Mexico in 1522 and at Potosí in Bolivia in 1545. International trade came to depend on coins such as the Spanish dollar, the Maria Theresa thaler, and, later, the United States trade dollar. A formal gold specie standard was first established in 1821, when Britain adopted it following the introduction of the gold sovereign by the new Royal Mint at Tower Hill in 1816. The United Province of Canada in 1854, Newfoundland in 1865, and the United States and Germany (de jure) in 1873 adopted gold. The United States used the eagle as its unit, Germany introduced the new gold mark, while Canada adopted a dual system based on both the American gold eagle and the British gold sovereign. Australia and New Zealand adopted the British gold standard, as did the British West Indies, while Newfoundland was the only British Empire territory to introduce its own gold coin. Royal Mint branches were established in Sydney, Melbourne, and Perth for the purpose of minting gold sovereigns from Australia's rich gold deposits. After the Civil War, Congress wanted to reestablish the metallic standard at pre-war rates. The market price of gold in greenbacks was above the pre-War fixed price ($20.67 per ounce of gold) requiring deflation to achieve the pre-War price. This was accomplished by growing the stock of money less rapidly than real output. By 1879 the market price matched the mint price of gold. The coinage act of 1873 (also known as the Crime of ‘73) demonetized silver. This act removed the 412.5 grain silver dollar from circulation. Subsequently silver was only used in coins worth less than $1 (fractional currency). With the resumption of convertibility on June 30, 1879 the government again paid its debts in gold, accepted greenbacks for customs and redeemed greenbacks on demand in gold. Greenbacks were therefore perfect substitutes for gold coins. 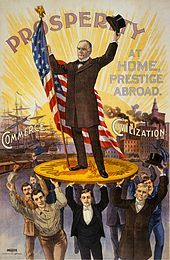 During the latter part of the nineteenth century the use of silver and a return to the bimetallic standard were recurrent political issues, raised especially by William Jennings Bryan, the People's Party and the Free Silver movement. In 1900 the gold dollar was declared the standard unit of account and a gold reserve for government issued paper notes was established. Greenbacks, silver certificates, and silver dollars continued to be legal tender, all redeemable in gold. By the end of 1913, the classical gold standard was at its peak but World War I caused many countries to suspend or abandon it. According to Lawrence Officer the main cause of the gold standard’s failure to resume its previous position after World War I was “the Bank of England's precarious liquidity position and the gold-exchange standard.” A run on sterling caused Britain to impose exchange controls that fatally weakened the standard; convertibility was not legally suspended, but gold prices no longer played the role that they did before. In financing the war and abandoning gold, many of the belligerents suffered drastic inflations. Price levels doubled in the US and Britain, tripled in France and quadrupled in Italy. Exchange rates changed less, even though European inflations were more severe than America’s. This meant that the costs of American goods decreased relative to those in Europe. Between August 1914 and spring of 1915, the dollar value of US exports tripled and its trade surplus exceeded $1 billion for the first time. The US did not suspend the gold standard during the war. The newly created Federal Reserve intervened in currency markets and sold bonds to “sterilize” some of the gold imports that would have otherwise increased the stock of money. By 1927 many countries had returned to the gold standard. As a result of World War I the United States, which had been a net debtor country, had become a net creditor by 1919. The British Gold Standard Act 1925 both introduced the gold bullion standard and simultaneously repealed the gold specie standard. The new standard ended the circulation of gold specie coins. Instead, the law compelled the authorities to sell gold bullion on demand at a fixed price, but "only in the form of bars containing approximately four hundred ounces troy [12 kg] of fine gold". John Maynard Keynes, citing deflationary dangers, argued against resumption of the gold standard. By fixing the price at the pre-war rate of $4.86,[clarification needed] Churchill is argued to have made an error that led to depression, unemployment and the 1926 general strike. The decision was described by Andrew Turnbull as a "historic mistake". The interwar partially-backed gold standard was inherently unstable because of the conflict between the expansion of liabilities to foreign central banks and the resulting deterioration in the Bank of England's reserve ratio. France was then attempting to make Paris a world class financial center, and it received large gold flows as well. Some economic historians, such as Barry Eichengreen, blame the gold standard of the 1920s for prolonging the economic depression which started in 1929 and lasted for about a decade. In the United States, adherence to the gold standard prevented the Federal Reserve from expanding the money supply to stimulate the economy, fund insolvent banks and fund government deficits that could "prime the pump" for an expansion. Once off the gold standard, it became free to engage in such money creation. The gold standard limited the flexibility of the central banks' monetary policy by limiting their ability to expand the money supply. In the US, the central bank was required by the Federal Reserve Act (1913) to have gold backing 40% of its demand notes. Others, including former Federal Reserve Chairman Ben Bernanke and Nobel Prize-winner Milton Friedman, place the blame for the severity and length of the Great Depression at the feet of the Federal Reserve, mostly due to the deliberate tightening of monetary policy even after the end of the gold standard. They blamed the US major economic contraction in 1937 on tightening of monetary policy resulting in higher cost of capital, weaker securities markets, reduced net government contribution to income, the undistributed profits tax and higher labor costs. The money supply peaked in March 1937, with a trough in May 1938. The forced contraction of the money supply resulted in deflation. Even as nominal interest rates dropped, deflation-adjusted real interest rates remained high, rewarding those who held onto money instead of spending it, further slowing the economy. Recovery in the United States was slower than in Britain, in part due to Congressional reluctance to abandon the gold standard and float the U.S. currency as Britain had done. World production for 2011 was circa 2,700 tonnes. Since the 1950s, annual gold output growth has approximately kept pace with world population growth (i.e. a doubling in this period) although it has lagged behind world economic growth (approximately 8-fold increase since the 1950s, and 4x since 1980). Mainstream economists believe that economic recessions can be largely mitigated by increasing the money supply during economic downturns. A gold standard means that the money supply would be determined by the gold supply and hence monetary policy could no longer be used to stabilize the economy. The money supply would essentially be determined by the rate of gold production. When gold stocks increase more rapidly than the economy, there is inflation and the reverse is also true. The consensus view is that the gold standard contributed to the severity and length of the Great Depression, as under the gold standard central banks could not expand credit at a fast enough rate to offset deflationary forces. A return to the gold standard was considered by the US Gold Commission back in 1982, but found only minority support. In 2001 Malaysian Prime Minister Mahathir bin Mohamad proposed a new currency that would be used initially for international trade among Muslim nations, using a Modern Islamic gold dinar, defined as 4.25 grams of pure (24-carat) gold. Mahathir claimed it would be a stable unit of account and a political symbol of unity between Islamic nations. This would purportedly reduce dependence on the US dollar and establish a non-debt-backed currency in accord with Sharia law that prohibited the charging of interest. As of 2013[update] the global monetary system continued to rely on the US dollar as the main reserve currency. Former U.S. Federal Reserve Chairman, Alan Greenspan acknowledged he was one of "a small minority" within the central bank that had some positive view on the gold standard. In a 1966 essay he contributed to a book by Ayn Rand, titled "Gold and Economic Freedom", Greenspan argued the case for returning to a 'pure' gold standard; in that essay he described supporters of fiat currencies as "welfare statists" intending to use monetary policy to finance deficit spending. More recently he claimed that by focusing on targeting inflation "central bankers have behaved as though we were on the gold standard", rendering a return to the standard unnecessary. The economist Allan H. Meltzer of Carnegie Mellon University presented arguments against Ron Paul's advocacy of the gold standard from the 1970s onward. He sometimes summarized his opposition by stating simply, "[W]e don’t have the gold standard. It’s not because we don’t know about the gold standard, it’s because we do." ^ "Gold standard Facts, information, pictures Encyclopedia.com articles about Gold standard". www.encyclopedia.com. Retrieved 2015-12-05. ^ William O. Scroggs. "What Is Left of the Gold Standard?". foreignaffairs.com. Retrieved 28 January 2015. ^ a b "Gold Standard". IGM Forum. 12 January 2012. Retrieved 27 December 2015. ^ Appelbaum, Binyamin (2015-12-01). "G.O.P. Candidates Viewing Economy's Past Through Gold-Colored Glasses". The New York Times. ISSN 0362-4331. Retrieved 2017-07-20. ^ a b c d Lipsey 1975, pp. 683-702. ^ Bordo, Dittmar & Gavin 2003 "in a world with two capital goods, the one with the lower depreciation rate emerges as commodity money"
^ "World's Oldest Coin - First Coins". rg.ancients.info. Retrieved 2015-12-05. ^ Lopez, Robert Sabatino (Summer 1951). "The Dollar of the Middle Ages". The Journal of Economic History. 11 (3): 209–234. doi:10.1017/s0022050700084746. JSTOR 2113933. ^ Rothwell, Richard Pennefather. (1893). Universal Bimetallism and An International Monetary Clearing House, together with A Record of the World's Money, Statistics of Gold and Silver, Etc. New York: The Scientific Publishing Company. pp. 45. ^ Andrei, Liviu C. (2011). Money and Market in the Economy of All Times: Another World History of Money and Pre-Money Based Economies. Xlibris Corporation. pp. 146–147. ^ James Powell, A History of the Canadian Dollar (Ottawa: Bank of Canada, 2005), pp. 22-23, 33. ^ Consolidated Statutes of Newfoundland (1st Series, 1874), Title XXV, "Of the Regulation of Trade in Certain Cases", c. 92, Of the Currency, s. 8. ^ "Small change". UK Parliament. Retrieved 2019-02-09. ^ a b Walton & Rockoff 2010. ^ Metzler, Mark (2006). Lever of Empire: The International Gold Standard and the Crisis of Liberalism in Prewar Japan. Berkeley: University of California Press. ISBN 978-0-520-24420-7. ^ a b c d e Elwell 2011. ^ Friedman & Schwartz 1963, p. 79. ^ Kemmerer, Edwin Walter (1994). Gold and the Gold Standard: The Story of Gold Money Past, Present and Future. Princeton, NJ: McGraw-Hill Book, Company, Inc. pp. 154 (238 pg). ISBN 9781610164429. ^ Nicholson, J. S. (April 1915). "The Abandonment of the Gold Standard". The Quarterly Review. 223: 409–423. ^ Drummond, Ian M. The Gold Standard and the International Monetary System 1900–1939. Macmillan Education, LTD, 1987. ^ "Gold Standard Act 1925 1.c.2". ^ "Articles: Free the Planet: Gold Standard Act 1925". Free the Planet. 2009-06-10. Archived from the original on 2012-07-13. Retrieved 2012-07-09. ^ Keynes, John Maynard (1920). Economic Consequences of the Peace. New York: Harcourt, Brace and Rowe. ^ "Thatcher warned Major about exchange rate risks before ERM crisis". The Guardian. 2017-12-29. Retrieved 2017-12-29. ^ Cassel, Gustav. The Downfall of the Gold Standard. Oxford University Press, 1936. ^ "Chancellor's Commons Speech". Freetheplanet.net. Archived from the original on 2012-07-09. Retrieved 2012-07-09. ^ Eichengreen, Barry J. (September 15, 2008). Globalizing Capital: A History of the International Monetary System. Princeton University Press. pp. 61–. ISBN 978-0-691-13937-1. Retrieved November 23, 2010. ^ Officer, Lawrence. "Breakdown of the Interwar Gold Standard". Eh.net. Archived from the original on November 24, 2005. Retrieved 2012-07-09. ^ Officer, Lawrence. "there was ongoing tension with France, that resented the sterling-dominated gold- exchange standard and desired to cash in its sterling holding for gold to aid its objective of achieving first-class financial status for Paris". Eh.net. Archived from the original on November 24, 2005. Retrieved 2012-07-09. ^ American Economic Association (2000–2011). "The Elasticity of the Federal Reserve Note". The American Economic Review. ITHAKA. 26 (4): 683–690. JSTOR 1807996. ^ "Remarks by Governor Ben S. Bernanke At the Conference to Honor Milton Friedman". The Federal Reserve Board. November 8, 2002. Retrieved December 24, 2011. ^ Friedman & Schwartz 1963, p. 543. ^ Friedman & Schwartz 1963, p. 544. ^ a b "FRB: Speech, Bernanke-Money, Gold, and the Great Depression – March 2, 2004". Federalreserve.gov. 2004-03-02. Retrieved 2010-07-24. ^ "1931—"The Tragic Year"". Ludwig von Mises Institute. Retrieved December 24, 2011. The inflationary attempts of the government from January to October were thus offset by the people's attempts to convert their bank deposits into legal tender" "Hence, the will of the public caused bank reserves to decline by $400 million in the latter half of 1931, and the money supply, as a consequence, fell by over four billion dollars in the same period. ^ "1931—"The Tragic Year"". Ludwig von Mises Institute. Retrieved December 24, 2011. Throughout the European crisis, the Federal Reserve, particularly the New York Bank, tried its best to aid the European governments and to prop up unsound credit positions. ... The New York Federal Reserve loaned, in 1931, $125 million to the Bank of England, $25 million to the German Reichsbank, and smaller amounts to Hungary and Austria. As a result, much frozen assets were shifted, to become burdens to the United States. ^ Dominic Sandbrook (2011-12-31). "In August 1932, the British colonies and dominions met in the Canadian capital, Ottawa, and agreed a policy of Imperial Preference, putting high tariffs on goods from outside the Empire". London: Dailymail.co.uk. Retrieved 2012-07-09. ^ M. Friedman "the severity of each of the major contractions – 1920–21, 1929–33 and 1937–38 is directly attributable to acts of commission and omission by the Reserve authorities". ^ Robert P. Murphy. "Another major factor is that governments in the 1930s were interfering with wages and prices more so than at any prior point in (peacetime) history". Mises.org. Retrieved 2012-07-09. ^ "High Taxes and High Budget Deficits-The Hoover–Roosevelt Tax Increases of the 1930s" (PDF). ^ "per data from Economics Professor Mark J. Perry". Mjperry.blogspot.com. 2008-11-09. Retrieved 2012-07-09. ^ Eichengreen, Barry; Mitchener, Kris (August 2003). "The Great Depression as a Credit Boom Gone Wrong" (PDF). Retrieved December 24, 2011. ^ Gold and Economic Freedom by Alan Greenspan 1966 "Great Britain fared even worse, and rather than absorb the full consequences of her previous folly, she abandoned the gold standard completely in 1931, tearing asunder what remained of the fabric of confidence and inducing a world-wide series of bank failures." ^ Farrell, Paul B. (December 13, 2011). "Our decade from hell will get worse in 2012". MarketWatch. Retrieved December 24, 2011. As financial historian Niall Ferguson writes in Newsweek: "Double-Dip Depression ... We forget that the Great Depression was like a soccer match, there were two halves." The 1929 crash kicked off the first half. But what "made the depression truly 'great' ... began with the European banking crisis of 1931." Sound familiar? ^ Aftershock by Robert B. Reich, published 2010 Chapter 1 Eccles's Insight. ^ Prior, Ed (1 April 2013). "How much gold is there in the world?" – via www.bbc.com. ^ "FAQs | Investment | World Gold Council". Gold.org. Retrieved 2013-09-12. ^ "Measuring Worth - GDP result". ^ "Download entire World Economic Outlook database, April 2013". ^ Krech III, Shepard; McNeill, John Robert; Merchant, Carolyn (2004). Encyclopedia of World Environmental History. 2: F–N. New York City: Routledge. p. 597. ISBN 978-0-415-93734-4. OCLC 174950341. ^ Hoppe, Hans-Herman (1992). Mark Skousen (ed.). Dissent on Keynes, A Critical Appraisal of Economics. pp. 199–223. ^ "Gold as Money: FAQ". Mises.org. Ludwig von Mises Institute. Archived from the original on July 14, 2011. Retrieved 12 August 2011. ^ a b c d Bordo 2008. ^ a b "Advantages of the Gold Standard" (PDF). The Gold Standard: Perspectives in the Austrian School. The Ludwig von Mises Institute. Retrieved 9 January 2011. ^ "Why the Gold Standard Is the World's Worst Economic Idea, in 2 Charts – Matthew O'Brien". The Atlantic. 2012-08-26. Retrieved 2013-04-19. ^ "Reform of the International Monetary and Financial System" (PDF). Bank of England. December 2011. Archived from the original (PDF) on December 18, 2011. Retrieved December 24, 2011. Countries with current account surpluses accumulated gold, while deficit countries saw their gold stocks diminish. This, in turn, contributed to upward pressure on domestic spending and prices in surplus countries and downward pressure on them in deficit countries, thereby leading to a change ... that should, eventually, have reduced imbalances. ^ Reinhart, Carmen M.; Rogoff, Kenneth S. (2008). This Time is Different. Princeton University Press. p. 143. ^ Giovannini, Alberto; De Melo, Martha (1993). "Government Revenue from Financial Repression". The American Economic Review. 83 (4): 953–963. JSTOR 2117587. ^ Greenspan, Alan (1966). "Gold and Economic Freedom". Constitution.org. Retrieved December 24, 2011. ^ Hill, Liezel (January 13, 2011). "Gold mine output hit record in 2010, more gains likely this year – GFMS". Mining Weekly. Retrieved December 24, 2011. ^ U.S. Geological Survey (January 2011). "GOLD" (PDF). U.S. Geological Survey, Mineral Commodity Summaries. U.S. Department of the Interior | U.S. Geological Survey. Retrieved 10 July 2012. ^ Mayer, David A. Gold standard at Google Books The Everything Economics Book: From theory to practice, your complete guide to understanding economics today (Everything Series) ISBN 978-1-4405-0602-4. 2010. pp. 33–34. ^ Mankiw, N. Gregory (2002). Macroeconomics (5th ed.). Worth. pp. 238–255. ISBN 978-0-324-17190-7. ^ Krugman, Paul. "The Gold Bug Variations". Slate.com. Retrieved 2009-02-13. ^ a b Bordo, Dittmar & Gavin 2003. ^ Keogh, Bryan (May 13, 2009). "Real Rate Shock Hits CEOs as Borrowing Costs Impede Recovery". Bloomberg. Retrieved December 24, 2011. Deflation hurts borrowers and rewards savers," said Drew Matus, senior economist at Banc of America Securities-Merrill Lynch in New York, in a telephone interview. "If you do borrow right now, and we go through a period of deflation, your cost of borrowing just went through the roof. ^ Mauldin, John; Tepper, Jonathan (2011-02-09). Endgame: The End of the Debt SuperCycle and How It Changes Everything. Hoboken, N.J.: John Wiley. ISBN 978-1-118-00457-9. ^ "The greater of two evils". The Economist. May 7, 2009. Retrieved December 24, 2011. ^ DeLong, Brad (1996-08-10). "Why Not the Gold Standard?". Berkeley, California: University of California, Berkeley. Retrieved 2008-09-25. ^ Timberlake, Richard H. (2005). "Gold Standards and the Real Bills Doctrine in US Monetary Policy". Econ Journal Watch. 2 (2): 196–233. ^ Warburton, Clark (1966). "The Monetary Disequilibrium Hypothesis". Depression, Inflation, and Monetary Policy: Selected Papers, 1945–1953. Baltimore: Johns Hopkins University Press. pp. 25–35. OCLC 736401. ^ a b Hamilton 2005. ^ Christina D. Romer (20 December 2003). "Great Depression" (PDF). ELSA. University of California Regents. Archived from the original (PDF) on 14 December 2011. Retrieved 10 July 2012. ^ McArdle, Megan (2007-09-04). "There's gold in them thar standards!". The Atlantic Monthly. Retrieved 2008-11-12. ^ Demirgüç-Kunt, Asli; Enrica Detragiache (April 2005). "Cross-Country Empirical Studies of Systemic Bank Distress: A Survey". National Institute Economic Review. 192 (1): 68–83. doi:10.1177/002795010519200108. ISSN 0027-9501. OCLC 90233776. Retrieved 2008-11-12. ^ "the quantity of money supplied by the Fed must be equal to the quantity demanded by money holders" (PDF). Archived from the original (PDF) on June 16, 2012. Retrieved 2012-07-09. ^ Paul, Ron; Lewis Lehrman (1982). The case for gold: a minority report of the U.S. Gold Commission (PDF). Washington, D.C.: Cato Institute. p. 160. ISBN 978-0-932790-31-6. OCLC 8763972. Retrieved 2008-11-12. ^ al-'Amraawi, Muhammad; Al-Khammar al-Baqqaali; Ahmad Saabir; Al-Hussayn ibn Haashim; Abu Sayf Kharkhaash; Mubarak Sa'doun al-Mutawwa'; Malik Abu Hamza Sezgin; Abdassamad Clarke; Asadullah Yate (2001-07-01). "Declaration of 'Ulama on the Gold Dinar". Islam i Dag. Archived from the original on 2008-06-24. Retrieved 2008-11-14. ^ McGregor, Richard (2011-01-16). "Richard McGregor:Hu questions future role of US dollar. Financial Times, January 16, 2011". Financial Times. Retrieved December 24, 2011. ^ "Conduct of Monetary Policy: Report of the Federal Reserve Board Pursuant to the Full Employment and Balanced Growth Act of 1978, P.L. 95-523 and The State of the Economy : Hearing Before the Subcommittee on Domestic and International Monetary Policy of the Committee on Banking and Financial Services, House of Representatives, One Hundred Fifth Congress, Second Session, July 22, 1998 - FRASER - St. Louis Fed". ^ Greenspan, Alan (July 1966). "Gold and Economic Freedom". The Objectivist. 5 (7). Retrieved 2008-10-16. ^ Paul, Ron. End the Fed. p. xxiii. ^ Boaz, David (2009-03-12). "Time to Think about the Gold Standard?". Cato Institute. Retrieved 2018-05-05. ^ Clark, Stephen (March 3, 2011). "Utah Considers Return to Gold, Silver Coins". Fox News. Retrieved December 24, 2011. ^ CNN (2011-03-29). "Utah: Forget dollars. How about gold?". ^ Spillius, Alex (2011-03-18). "Tea Party legislation reveals anxiety at US direction under Barack Obama". The Daily Telegraph. London. ^ Appelbaum, Binyamin (2015-12-01). "The Good Old Days of the Gold Standard? Not Really, Historians Say". The New York Times. ISSN 0362-4331. Retrieved 2015-12-02. ^ Bowyer, Jerry (23 October 2013). "My Friendly Debate On The Gold Standard With Allan Meltzer, The World's Leading Monetarist". Forbes / Contributor Opinions. Retrieved 27 December 2015. Friedman, Milton; Schwartz, Anna Jacobson (1963). 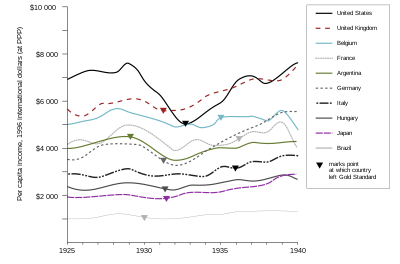 A Monetary History of the US 1867–1960. Princeton University Press. p. 543. ISBN 978-0-691-04147-6. Retrieved 2012-07-09. Hamilton, James D. (April 1988). "Role of the International Gold Standard in Propagating the Great Depression". Contemporary Economic Policy. 6 (2): 67–89. doi:10.1111/j.1465-7287.1988.tb00286.x. Archived from the original on 2013-01-05. Retrieved 2008-11-12. Officer, Lawrence H. (2008). "bimetallism". In Steven N. Durlauf and Lawrence E. Blume (ed.). The New Palgrave Dictionary of Economics. The New Palgrave Dictionary of Economics, 2nd Edition. Basingstoke: Palgrave Macmillan. p. 488. doi:10.1057/9780230226203.0136. ISBN 978-0-333-78676-5. OCLC 181424188. Retrieved 2008-11-13. Bernanke, Ben; Harold James (October 1990). "The Gold Standard, Deflation, and Financial Crisis in the Great Depression: An International Comparison". NBER Working Paper No. 3488. doi:10.3386/w3488. Also published as: Bernanke, Ben; Harold James (1991). "The Gold Standard, Deflation, and Financial Crisis in the Great Depression: An International Comparison". In R. Glenn Hubbard (ed.). Financial markets and financial crises. Chicago: University of Chicago Press. pp. 33–68. ISBN 978-0-226-35588-7. OCLC 231281602.